While working on my current book, I found that I needed a printed list to keep track of my progress. In many circumstances, computer-based lists work fine but sometimes I want a piece of paper which I can markup with checks, arrows, and extraneous comments. The paper sits on my desk as a working tool—never hiding behind an open window on the computer screen. It seems archaic but, for me, it’s just easier. My problem involved printing a clean list of chapters without a load of extras. I use the Sigil EPUB Publishing software to put together my books. To get my printout, all I needed was a list of the chapters for annotation and tracking of my progress. The Content.opf file (a standard EPUB file found in all EPUBs) had what I needed with a little bit of extra coding. I could live with printing the chapter list with coding and all, but, by using Ryan’s RegEx Tester, I quickly stripped out all of the unneeded code. I found it really cool to watch the letters disappear from the Results pane as I added each unwanted character to the Regular Expression field. When I reached the text I planned to save, I entered the ungreedy universal wildcard .*? which I placed inside parentheses (.*?) to grab the subpattern and used that first backreference $1 in the Replacement Text. Then, to get my list, I merely added the remainder of the unwanted code .x?html”/> to the RegEx field. Seeing the output I needed, I copied-and-pasted the list from the Results field into Notepad and printed it. No wonder I love Ryan’s RegEx Tester! 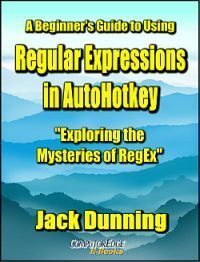 to replace the hidden RETURN used in the RegEx Tester.